Hehe...where to date during weekend??? 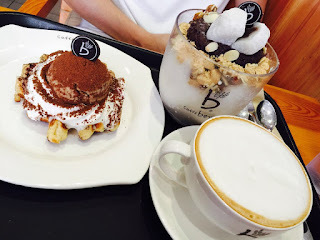 We are craving for coffee & dessert. We need to make our date sweeter and sweeter. Decided to have bingsu (upper-class-ice kacang) in Caffe Benne. It's located in Gurney Paragon. The PatBingsu came with layers of toppings, various nuts and beans, on top of ice-shave. Well, we prefer if the ice-shave is finer.